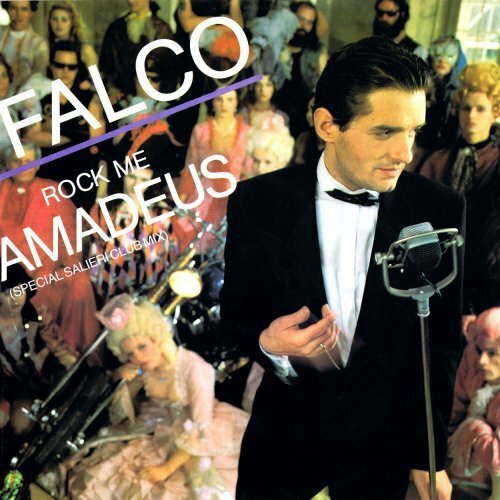 In 1985, Austrian artist Falco released his eventual number one Billboard single Rock Me Amadeus and introduced me to a technology in the music industry that hadn't really been exposed to the masses at that level. The song featured a cool stuttering vocal lead that, at the time, was mesmerizing to hear in the midst of a funky beat and catchy gang vocal of men yelling the song title. It was a large commercially successful use of a vocal sampler. The idea that a person could record their voice and digitally reproduce it in different note values was just mind boggling to me. So after blood letting my ears from the 12 speaker sound system in my 77 red Chevette from listening to that tune over and over, I wandered into my local music store at the mall. A new portable keyboard, small enough to tuck under your shirt, called the Casio SK1 was prominently displayed. Because I worked at a department store in that mall, each time I entered the doors the staff smiled knowing where I was headed. I'd gazingly stare at the compact piece of musical engineering and experiment with the on-board microphone. It was amazing to record a burp which could then be reproduced like the bellow of an eery giant or quaint chipmunk. It only cost $99. It had to be mine. This little gem was my first gateway item to recording my very own music. I went to a friend's studio which had an 8-track reel to reel machine after spending nearly two weeks perfecting my 32 key maneuvering. I recorded my first official original song using that keyboard. I was bit by the music production bug. I snuck my first peek behind the curtain to see the Great and Powerful Oz that day. Thirty years later, I'm still enamored by the production process and how technology can make a song come alive. More than just the technical cool factor of computerized production is the rude awakening I received the more I delved into working with Spencer on his career. There are costs in music production that aren't just financial and time. There is also the cost of being educated on how to listen to a recorded song. I don't mean feeling a song or allowing the beat to move your feet. I mean the ability to discern the layering of each piece of a composition and how it's fit together (or not) like a complete puzzle in a recording. Understanding all the elements and steps in that process is a cost that must be factored into every project. There is more to music production than just a clever lyric or hook. I often listen to other new emerging artists and their recorded releases and am saddened by the fact they probably spent a lot of money on cool packaging for the CD, renting studio space, invested a lot of emotion into the lyrics and music, but left a lot of quality out of the project because they didn't understand some fundamentals about how to assemble a good production. In conversations I sometimes just say it is or isn't radio quality. I say this not to belittle an artist's ability or skill, but music production is an art that must be respected and if executed well, can truly earn an artist credibility among industry peers, executives and fans alike. I decided to write this from my viewpoint as a 30-year music enthusiast who has had a college level education the past few years with Grammy and Dove winning producers and industry veterans to guide my understanding. There are roles and processes in music production that I want to share for those learning how to get the best out of their music production projects. Namely, emerging artists. I'm certain that I could go into minutia detail about this topic, but I'm going to give a highlight of what aspects should really be focused upon. Consider this a loose checklist of what to think about before spending money on a recording. Each of these will make an impact on the quality of the end recording. Many new artists begin their career by singing along to a karaoke track and then proceed to record their vocal with that karaoke track. The industry slang term for singing along to a karaoke track is called a two-track or two-mix recording. Simply, there is one track of music that has already been mixed and mastered and there is one or more of the vocals. This is easy to detect when listening to the mix and is a quick indicator of an amateur production versus a professional production. Many artists buy pre-made tracks and do a two-track recording because it's less expensive than a full studio project which creates the song one instrument or element at a time. A true multi-track recording is when every instrument, vocal and sound effect are all layered on top of one another in the software. It's called a session and in order to get the best possible sounding production, this is the best and only method used by professional industry artists and labels. A mistake often made by new artists who write their own music is to create a song that is more like a novel and less like a newspaper column. Not to say that long songs aren't nice works of creativity, but if the artist intends to make their music commercially viable, song length is imperative. Things like how long it takes before the chorus starts, which ideally should be within the first 45 seconds of a track, can affect listener attention span or industry executive attitude. Song length of under 4 minutes make it a likely candidate for radio stations to consider for rotation. The term "radio edit" is reserved for a few reasons, but mostly because of song length. Often times when you buy an artist's album the song may be longer or have more creative instrumental parts than what was made popular on the radio. Let's face it, radio is a business and the more songs they can pack in an hour, the more money there is to be made. Again, if it's the artist also composing the music, this may not be as concerning, but in cases where a song is created for an artist, knowing the vocal capabilities like octave range and whether the vocalist is capable of technically handling the style or required skill for the vocal part is paramount. Often times there is a deficit in the song composition and vocalist capability. Some songs are too big for a singer. Some songs are too minimal for a singer. So having experienced composers who also know the vocalist on the song can help make sure the song is created in a way that suits the ability and image of the artist singing or band members playing. Composers are often able to envision ways to fill out a track with other instrumentation including vocals. Often times a track may have emptiness or clutter simply because the arranger of the song doesn't understand the complexity of sound space. If I can refer back to the art metaphor, imagine an empty canvas that is unpainted. The artist can clutter the canvas with so much color and detail that it can be overwhelming to the viewer. Sometimes the best art is very simple and easy to discern. The same goes with music composition. Understanding the delicate balance between the music and the vocals is where experienced composers can be spotted by industry executives and music aficionados. Knowing where a vocal part can fill that sound space or where an instrument is needed requires a trained ear. It's easy to replicate the current sound and make a similar riff or chord progression of what's hot on the radio. This is evident in a lot of emerging artist's production. A lot of bands or artists are heard as similar to so-and-so because their production wasn't scrutinized by experienced composers who know the genre and are highly skilled in avoiding replication, but also skilled in including elements within the composition that a consumer likes. A simple thing like a kick bass in the percussion and the way it's tuned can make a huge difference in the composition of a song. Knowing what the A level artists are using is very important to know before finishing a track's composition. A good composer also understands the importance of unique sound design. Sound design is simply the ability to create a sound that is unique. All too often, a song uses default sounds from software. Most of the very successful songs use unique and original sounds. Early in the electronic infusion of music in the 60's, cutting edge production included the use of unique sounds within a composition. It may be the odd, but appropriate inclusion of an orchestral instrument in the midst of a hard rock song. It may be the odd computer glitch squeals that are arranged in a rhythmic pattern that sets a song apart. Sound design is very much an important element of a well produced track. In contrast, a well executed natural instrument like an acoustic guitar can equally make or break a song depending how it's mic'd and recorded. That falls more into the studio engineer's world, but a composer should have an understanding of how to capture the sound that will make the music illuminate the melody to please the listeners' ears. and a few tips on how to vet them properly.